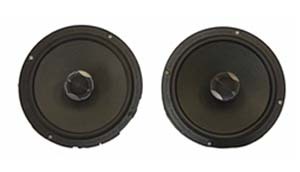 Speaker Pods with Speakers Kit, 7.1"
SP-1R: eGlideGoodies is proud to introduce the only 2014 to current Tour-Pal Speaker Pods with a mounting Depth of 3" (76.5 mm) Allowing clearance for the FOCAL KRC165 Speaker. Built using hand-laid fiberglass our Tour Pac Speaker Pods are designed to hold 6½" speakers. These Pods produce a much cleaner, richer, deeper sound. Now with Bass Boost Ports for a 21% increase in bass and 82% distortion reduction. 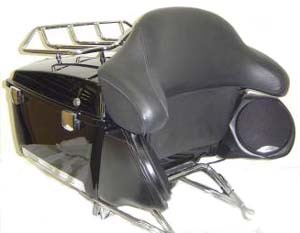 They come covered with black, soft-touch vinyl to match the color and texture of your motorcycle’s seat. SP-74: Premium Speaker Pods with 7.1" high performance speakers. High quality marine materials throughout. Internal sound dampening material to enhance bass response. 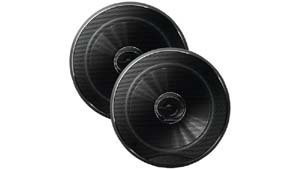 Thick walled design (unlike thin plastic stock parts) gives a better "thump" without rattles. Lifetime OEM warranty. Pods do not have cut-outs for rear controls. 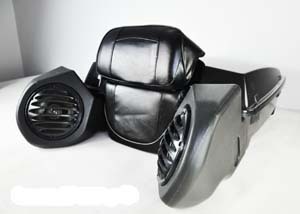 Replaces existing pods using stock mounting holes or can be added to 1998 - 2013 "king" tourpacks. 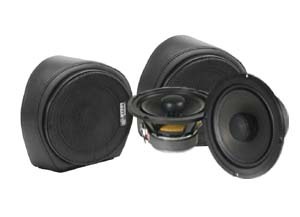 7.1" Speakers are a huge speaker upgrade - 83% over Harley™ stock!! 120 watts RMS / 240 watts peak, 94 dB at 1 watt efficiency. Fits King Tour-pak 1998 - 2013. SP-F87: The Pods accommodate speakers (not included) and are unfinished and ready to paint. Unfinished. They fit all Harley-Davidson "Chopped" Tour Paks. Accepts 6.5" round speakers. Speaker and speaker grills not included. 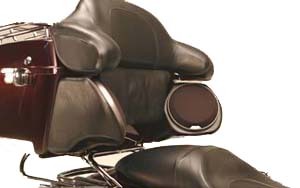 SP-1: Upgrade your Electra Glide Classic with tour-pak Speaker Pods! Fits 2013 and previous years full-size Harley Davidson Tour Pac® for Road King®, Electra Glide®, Road Glide® and Street Glide® models. Shaped much like the factory pieces, they fasten to your tour pack using three bolts with nuts and washers. Holes are not cut for rear-speaker volume and intercom switches; therefore, each speaker pod cover is smooth and solid and gives the look that it was made for your tour pack. Built using hand-laid fiberglass the Pods are designed to hold 6½" speakers, unlike factory Harley pods which only house a 5¼" speaker. These Pods produce a much cleaner, richer, deeper sound. 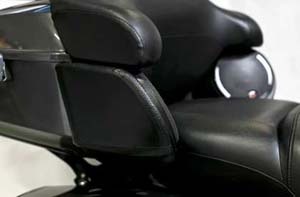 They come covered with black, soft-touch vinyl to match the color and texture of your motorcycle’s seat. 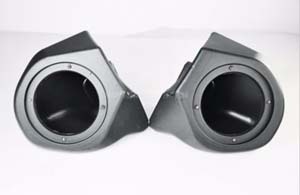 SP-SK: The SP-SK Speakers are Flush Mount 6 1/2" and are specially designed to fit the SP-1 Pods. (Does not fit chopped tour-paks. Holes are not cut for rear-speaker volume and intercom switches.) Size: 6.5", 250W Power, 4 Ohm impedance. SP-SK-HP: High performance FOCAL Integration speakers. 6.5" Coaxial Kit. Tweeter Processed Aluminum inverted dome rotating. Recommended to be used with amplifier!